Project Proposal of AAC block plant, annual out put 50,000-300,000m³. Autoclaved Aerated Concrete block is one kind of environmental Block. In fact AAC was perfected in the mid-1920s by the Swedish architect and inventor Dr. Johan Axel Eriksson, working with Professor Henrik Kreuger at the Royal Institute of Technology. Since it went into production in Sweden in 1929 in a factory in Hallabrottet and quickly became very popular. In the 1940s, the trademark Ytong was introduced, and was also often referred to as "blue concrete" in Sweden due to its blueish tinge. It used siliceous (fly ash, sand, slag) and calcareous (lime & cement) as the main raw materials, which through the process of batching, pouring, pre-curing, cutting, autoclaving, separating and packing to make into the final products. AAC block can be made into many kinds of bricks(for example:600×200×100,80×80×180,240×115×53,600×200×125),they could be used industry building and common building. AAC Block is the most mature technology of production and application in the worldwide nowadays. The product has light weight, high compressive strength, excellent thermal insulation, great acoustic insulation and high fire resistance. AAC has a large variety of sizes, and it is easy for nailing and milling like wood. So it is perfectly workable product. Raw materials include cement, lime, fly ash, gangue, river sand and aluminium powder etc. Production through batching, mixing, casting, cutting and autoclaving. 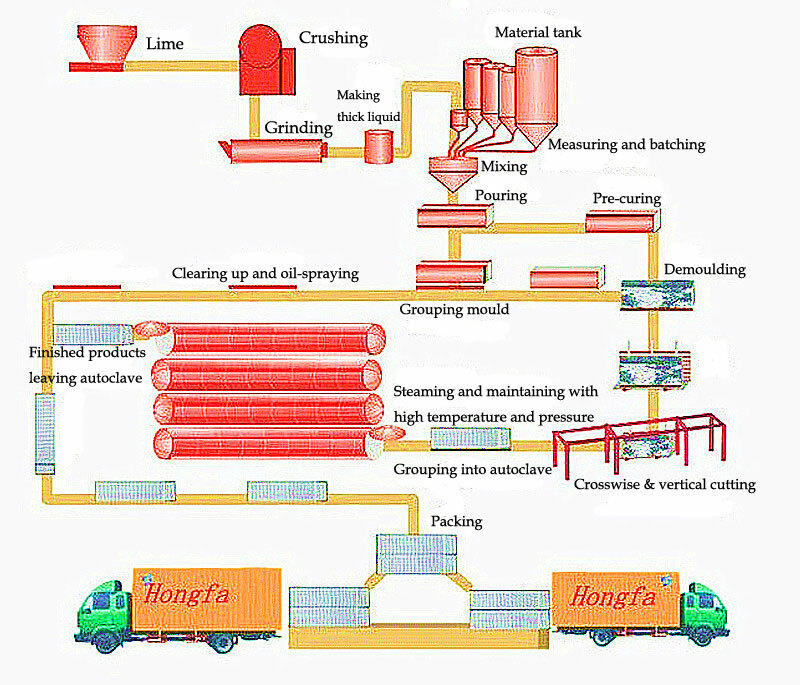 Process: Stocking raw materials, mixing, molding, forming, cutting, evaporating and curing, crane cramp, transporting, etc. If you have interest in these products, please leave your message, our relevant staff will contact you quickly.